test1 이라는 laravel project 를 하나 만든다. Composer 로 laravel framework project 를 하나 만들면 project directory 에서 아래같은 directory 구조를 볼 수 있다. 이 중에서 app 부분이 우리가 작성할 code 들이 들어가는 곳이다. routes/web.php 에 route 설정을 해주면 된다. 이전버전의 routes.php 가 이리로 옮겨 온 것으로 보면 된다. 실제로는 routes.php 대신에 RouteServiceProvider.php 가 추가되고, RouteServiceProvider에서 web.php 를 호출하고 있다. 자동으로 login(auth) 관련 기능을 추가한다. 기본적인 layout 은 아래 경로에 제공된다. 이 녀석을 이용해서 간단한 view(resources\views\welcome.blade.php) 를 하나 만들자. welcome.blade.php 는 위의 web.php 에서 설정한 route 에 의해 호출되는 show() 안에서 호출된다. 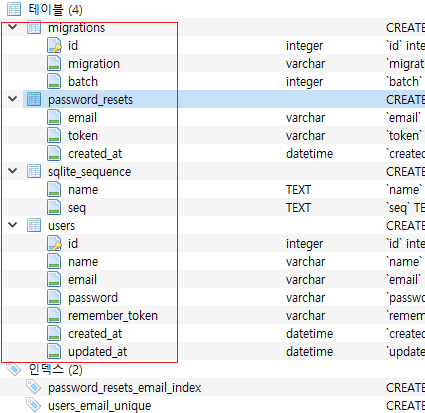 migration 을 해서 db 를 만들어 줄 수 있는데, 이때 .env file 에 db 정보를 setting 해줘야 한다. 이 값들을 직접 수정해도 되고, .env 를 통해 override 할 수 있다. 여기서는 db 로 sqlite3 를 사용할 것이다. sqlite3 을 위해서 일단 아래 path 에 sqlite file 을 하나 만들자. absolute path 는 c:/a/programming/php/laravel/test1/database/database.sqlite 이다. 그리고 .env 에 아래같이 설정을 해주자. 그러면 아래처럼 table 이 생성된다.